The Vigor2912 Series designed for the small office applications helps your businesses achieve the goals of business growth, innovation and responsiveness. This ideal VPN/firewall router replaces the simple Wi-Fi router offered by ISPs. The dual WAN load-balance and redundancy ensures your office to stay connected. The network security is realized by robust firewall and Web Content Filtering. All your subscribed bandwidth can be smoothly allocated to the essential applications (e.g. VoIP) by the advanced QoS. 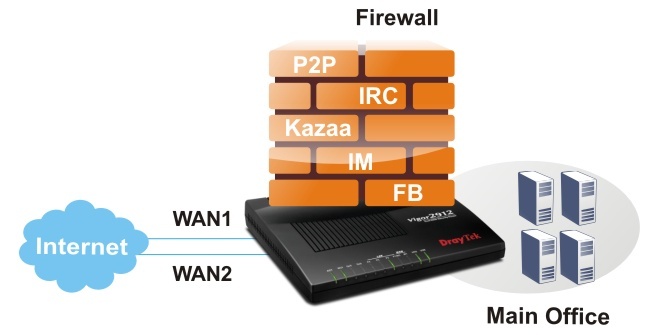 The VPN tunnels cover the needs of the inter-office / remote access via multiple protocols. The secure Wi-Fi network enables the office environment ready for the trend of BYOD (Bring Your Own Device) to enhance the productivity. At last but not least, the Vigor2912 Series supports the IPv6 for the seamless migration. The Vigor2912 Series offers two fast Ethernet ports as WAN interface (LAN port 1 can be configured as WAN 2.). You have the flexibility to choose different Internet feeds based on the local High Speed Internet plan offered by the ISP and get the reliable connection via dual WAN load-balance and redundancy. As enabling both WAN 1 and WAN 2, 2 WANs share Internet traffic requirements of your organization (load-balance). During downtime, you will always have an access to the Internet even if one of the WAN fails (redundancy). The USB port can be used for the connection of 3G/4G mobile broadband dongle as the USB WAN (WAN 3). The USB WAN interface can also be the primary access if the local fixed line service hasn’t been deployed yet. Another two popular applications are the FTP drive and network printers for the office. The Vigor2912 Series supports Object-based SPI firewall to set of Call/Data Filters and DoS/DDoS prevention. You can use pre-define objects or groups for IP, service type, keyword, file extension, etc., and mix these with the Time Scheduler or the VLAN groups as required. The Web Content Filter, powered by the CYREN Web WCF of Content Security Management (CSM) eases configurations to prevent access to inappropriate sites. The IM/P2P/Protocol filter and URL Content Filter are also available in CSM. 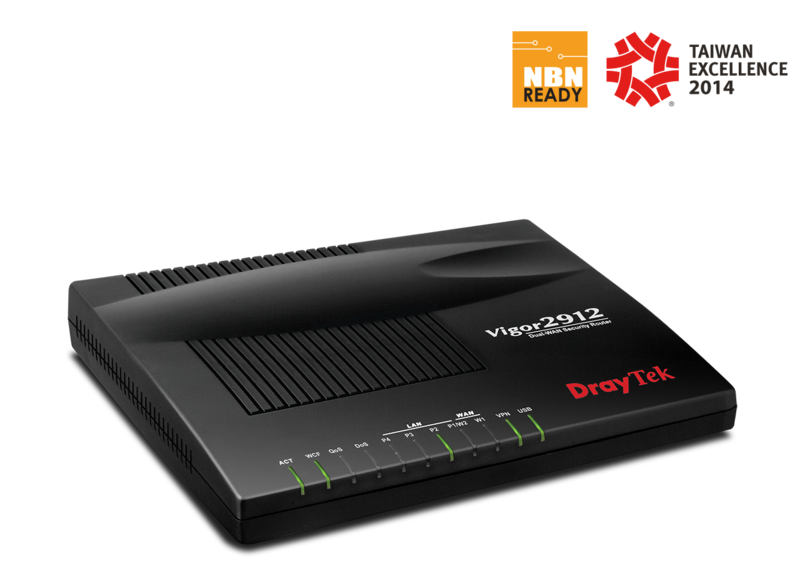 Your network security is fully managed by the Vigor2912 Series. Small offices normally choose the affordable Internet plan instead of increasing the bandwidth over 100Mbps. Hence, how to reserve and prioritize bandwidth for the essential applications is critical to operation. The Vigor2912 Series has VoIP QoS to guarantee the priority for VoIP calls automatically once VoIP calls was detected. In addition to QoS, you can manage the bandwidth consumption of every employee based on the individual IP via Session Limit and Bandwidth Limit. The Smart Bandwidth Limit allows you to only set bandwidth reservation for PCs operated essential tasks. Other PCs have the session limitation to prevent the inappropriate usages (e.g. P2P download). Once exceeding the limitation, their speed rates will be downgrade to your customized numbers. You can guarantee all subscribed bandwidth to have proper usage. The Vigor2912 series support up to 16 LAN-to-LAN VPN tunnels secure remote data access, such as inter-office, or home-office communication with multi-protocols: PPTP /IPSec/L2P/L2TP over IPSec. Its advanced AES/DES/3DES encryption and IKE Authentication provide you with strong security. The dual WAN feature can not only allow you to run load-balancing but also backup. If the main VPN fail, the second VPN takes over. 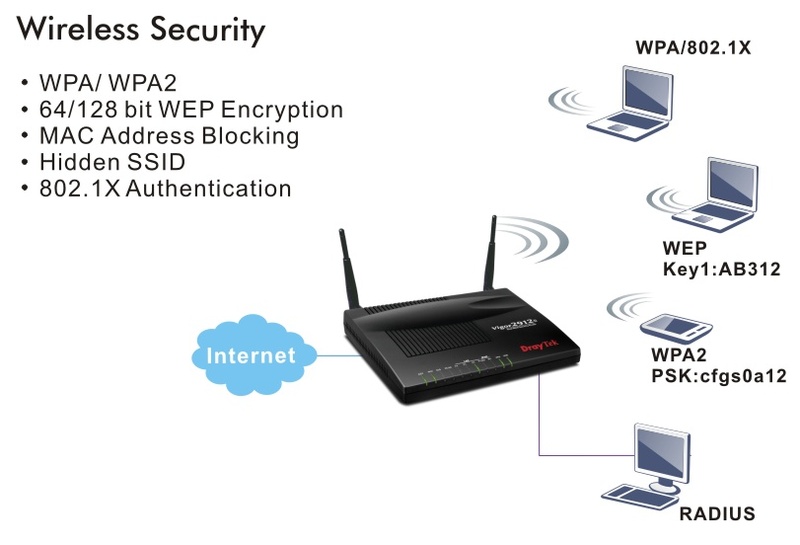 The Wi-Fi access is fully protected by security and encryption protocols, including WEP/WPA/WPA2, MAC Address Control, Multiple SSID, Wireless LAN Isolation, Wireless VLAN and 802.1x Authentication. You can ensure only authorized devices to access the Wi-Fi network and separate guest and corporate network via SSID. The Wireless Rate Control function allows connection rates for each network device to be individually managed as required. The WMM (Wi-Fi Multi-Media) function allows setting of priority levels for various applications: voice, video, data, etc., so time-critical applications can be assigned higher priority levels. Furthermore, WDS (Wireless Distribution System) function allows you to extend the wireless coverage distance easily. 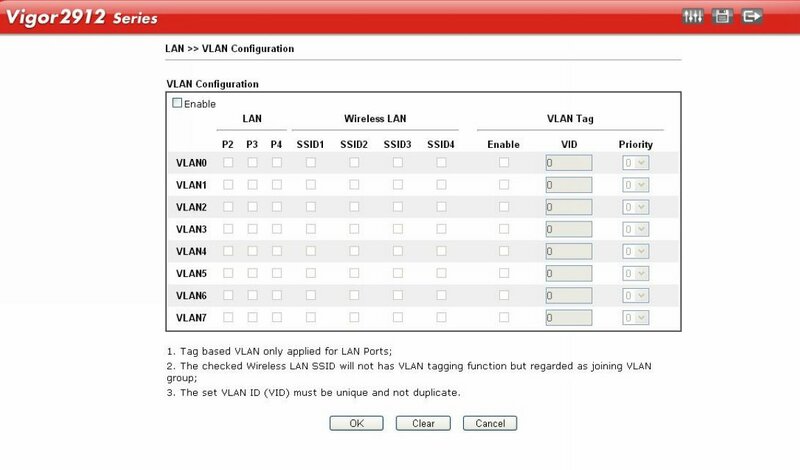 The “SSID VLAN grouping with LAN port” settings will allow each of the wireless SSIDs to be grouped within one of the VLANs. The WMM (Wi-Fi Multimedia) keeps the priority of voice, video and audio applications in a Wi-Fi network. With “Wireless/Station Control” deployed on the f/w 3.7.5 of Vigor2912n, you can let some cafe and small shops offer free “Wi-Fi” Internet but you still can register the Mac Addresses of their smart phone or tablet PCs. The “User Management” implemented on your router firmware can allow you to prevent any computer from accessing your Internet connection without a username or password. You can set scheduler or maximum usage time to your employees within office network. The user accounts can also be restricted by any other aspect of the firewall rule on a user-by-user basis. 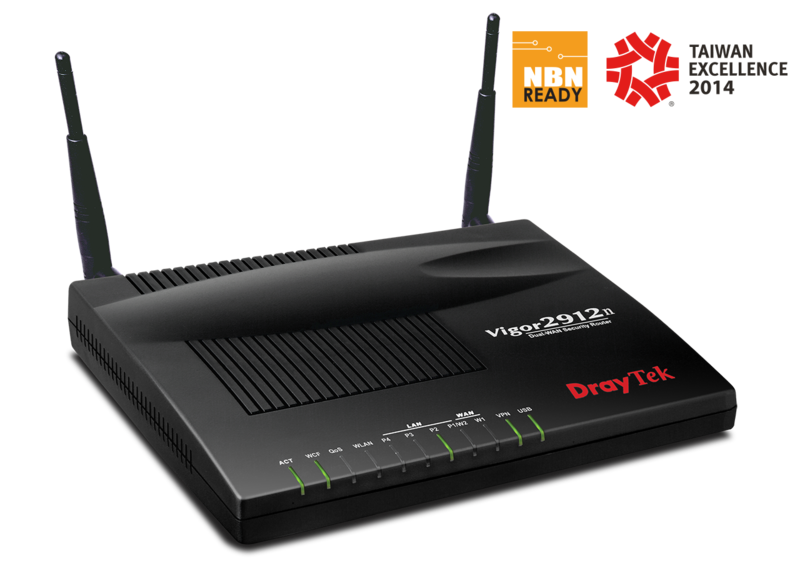 Vigor2912 series support DrayTek’s SmartMonitor network traffic analyzer (up to 30 users), which captures actual live data of activities in your managed network, such as the content of MSN entering to or out of your network. You can track specified files download/upload or view statistics on data type activities to realize what corporate related information have been released accidentally or on purpose. If your main office self-hosts VigorACS SI central management, your Vigor2912 series can be remotely managed for firmware upgrade, alarm of disconnection, VPN establishment and other settings.